2017 GMC Acadia Pros and Cons: Why (Not) This Car? To offer a direct competitor for other large three-row crossovers such as the Honda Pilot and Toyota, General Motors has dramatically downsized the Acadia for the 2017 model year. They shaved 7.2, 3.5, and 4.4 inches from the vehicle's length, width, and height, respectively. This makes the second-generation Acadia about the same size as the Toyota Highlander, a little smaller than the Honda Pilot, and much smaller than the Ford Explorer. The redesigned crossover also weighs over 500 pounds less than the original Acadia. For those (likely including many current owners) who want a vehicle the size of the old Acadia, that vehicle remains available as the Acadia Limited. Don't want a decade-old design? The Chevrolet Traverse will be all-new for 2018 and will be even larger. The next Buick Enclave likely will also remain about the same size. Buicks and GMCs are sold by the same dealers, so downsizing the Acadia also solves the problem of having two crossovers the same size in the same showrooms. And the new Acadia? Is it now a serious contender for those seeking a large (but not extra-large) crossover? Since the new Acadia promises some sportiness--the tested top-of-the-line Denali was equipped with sport-tuned multi-mode adaptive dampers--I drove it back-to-back with another three-row crossover I've been wanting to write up, the new Mazda CX-9. Why the 2017 GMC Acadia? The new GMC Acadia and new Mazda CX-9 both impressed me, but they differ considerably in appearance and character. The new Acadia most impressed me with how well it dealt with metro Detroit's deeply scarred roads. Many crossovers, hobbled by their relatively high centers of gravity, pitch and bobble across uneven road surfaces. The taller a vehicle is, the harder it is for its suspension to control body motions. In the attempt, some ride too firmly, pounding over even minor road imperfections, while others can feel bouncy. In contrast, the new Acadia's suspension tuning strikes an exceptional ride-handling balance. Driven across pockmarked pavement, it neither clomps nor floats. While impacts are not entirely absorbed, an even keel is maintained. The adaptive dampers (shock absorbers) available with the four-wheel-drive SLT-2 and Denali trims no doubt help when in their default mode (in sport mode bumps register somewhat more firmly). But Acadias without this $1,200 option probably ride nearly as well. The more firmly damped suspension of the Mazda CX-9, while better at managing bumps and chuckholes than most crossovers, slightly jiggles over less than perfectly smooth pavement. Like other, smaller Mazdas, it eagerly awaits the next curve, and never feels thoroughly calm and relaxed the way the Acadia does when pointed straight down the road. It's probably no accident that the new Acadia has the sort of manners people expect from a Cadillac. The architecture underpinning it was developed initially for the Cadillac SRX. It had to be designed with world-class refinement as a goal. GM led much of the industry in fitting cars with laminated front side windows to keep outside noises outside. Curiously, the new GMC Acadia lacks them. No matter, it's still very quiet, possibly the quietest vehicle in the class. Mazdas have long been noisier inside than competitors. But they've been working to fix this. The new CX-9 even has the laminated front side windows I expected to find in the new Acadia. It's not enough. While the CX-9 is quiet inside, especially at highway speeds I sensed more wind and road noise than in the Acadia. I've been going back-and-forth on whether to include handling among the reasons to buy the new GMC Acadia. As I've noted, in typical driving it feels larger, heavier, and less agile than the CX-9, which drives like a frisky compact hatch in comparison. If you want a three-row crossover that involves and engages you, the Mazda is the one to get. But switch to sport mode (which I did not prefer in typical daily driving) and spur the Acadia through some curves, and it's no Honda Pilot of Toyota Highlander, both of which lose their composure when pressed. Instead, the GMC rises to the occasion, carving tightly and predictably through corners with a moderate amount of body roll, little in the way of plowing, and commendable poise. The steering provides less feedback than the Mazda's, but it is accurate and well-weighted. On a mountain road where the Honda and Toyota would feel way out of their element the Acadia might even seem fun. The new Acadia can be purchased with an off-road-oriented All Terrain package that includes a twin-clutch rear differential. This differential can variably distribute torque to each rear wheel, and by doing so could further reduce understeer or even provoke oversteer. But it's not clear what on-road advantages this trick differential has been programmed to provide in the Acadia. This package is not available on the SLT-2 or Denali, so it is not possible to get an Acadia with both the fancy dampers and the fancy differential. Also worth noting: the All Terrain package deletes the otherwise standard third-row seat. A note on four-wheel-drive (4WD) vs. all-wheel-drive (AWD). I've been describing the Acadia's system as 4WD because you can lock it into 2WD mode. However, the only reason to do so would be a very small gain in fuel economy. If the Acadia was significantly less efficient in 4WD, the EPA would require that the Acadia default to 2WD every time it's restarted, and this doesn't happen. 4WD mode is essentially the same as AWD, as the system is fully automatic and can be used on dry pavement. Driving on snow-covered roads, the systems in the GMC and the Mazda both managed traction well. The vehicles' tires, not so much. Winter tires would stop and corner far better on snow and ice than the fitted all-season tires, and thus would enhance safety in winter driving much more than 4WD or AWD. Why Not the 2017 GMC Acadia? GM might have dramatically downsized the Acadia, but they didn't similarly downsize its price. The tested 2017 GMC Acadia Denali with 4WD and all factory options save a $1,995 rear seat entertainment system listed for...get this...$52,195. Equip this year's Denali and last year's Denali similarly and the 2016 listed for only $1,175 more despite being a much larger vehicle. Adjust for features and the difference is a little larger, as the new one includes about $1,750 in additional content, including a proximity key (expected on a vehicle with a price over $30,000, much less one with a price over $50,000), a hands-free tailgate (which I could rarely get to work), a driving mode selector, forward obstacle detection, lane departure prevention (like most such systems, more of a pain than a help), auto-dimming headlights, configurable LCD instrumentation, and heated second-row seats (the old Acadia was OLD). More to the point, an Acadia Denali with Technology Package (adaptive cruise control, around-view camera system) and a two-row sunroof lists for $3,560 more than a Toyota Highlander Limited Platinum, with additional content on the GMC accounting for about $1,400 of the difference. Compare a Honda Pilot Elite (adding an entertainment system to even things out), and the gap widens to $5,010. General Motors wants to position GMC as a semi-premium brand a half-step up from Chevrolet, Ford, Honda, Toyota, and such, and the Denali's pricing reflects this ambition. Of course, it's not necessary to spring for the Denali. An Acadia SLE with V6 and 4WD lists for $39,090. But the prices of the others drop much the same, such that a Toyota Highlander LE lists for about $4,000 less. Don't need the V6 or 4WD or any features that aren't standard? The zero-options Acadia SL lists for $29,995. But don't expect to find an SL on a dealer lot. my local dealer, with 42 Acadias in stock, has no SLs. A 2016 (no 2017s yet) CX-9 Signature lists for $6,070 less than an Acadia Denali with the Technology Package and sunroof, a huge gap. But fully half of this difference is accounted for by the Mazda's lack of features that many people will expect on a nearly $45,000 three-row crossover, including a heated and power adjustable steering wheel, ventilated front seats, and an around-view camera system (the feature I'd personally miss the most). Why just a half-step up? A full step would bring the Acadia Denali into competition with vehicles like the Acura MDX and Volvo XC90, and as I'll soon discuss it's not outfitted for such a battle. The least expensive vehicle in the next class up, the MDX, lists for $5,160 more than a loaded Acadia Denali, about $1,000 of which is accounted for by content. Evaluations of interior styling are inherently subjective. For me, GMC's interior styling, with its chunky trim, doesn't suit the vehicle's semi-premium positioning. GMC intends for the thickness of this trim to suggest a truck-like ruggedness. To me it just appears clunky and unrefined. Also, while this trim is real aluminum, it looks like silver-painted plastic. 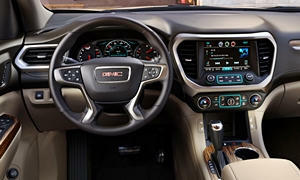 Similarly, no one who rode in the Acadia Denali while I had thought that the wood trim actually came from a tree, though GMC says that it is the real deal. I don't think I've ever seen real wood trim that appeared so fake. To be fair, the Acadia's interior otherwise looks and feels well-assembled from quality materials, and it's more than a match for those in the Honda and Toyota. The Mazda's sportier and more upscale interior styling is much more to my personal taste, but when you open the doors or operate the controls they don't feel quite as solid as those in the GMC. Mazda's have always been lightly built, and the company can't seem to entirely abandon its traditional way of doing things even when seeking to move upmarket. Enabled by the Acadia's weight loss, GMC now offers it with a 193-horsepower 2.5-liter four-cylinder engine. I haven't driven an Acadia with this engine, but past experience with sub-200-horsepower engines in two-ton vehicles suggests marginal performance. Even when fitted with the 310-horsepower 3.6-liter V6 the Acadia often feels lethargic, but this is more the fault of the throttle and transmission programming than the engine. Mat the pedal, and the Acadia with the V6 becomes fairly quick. Engaging sport mode improves the powertrain's responsiveness. The problem with sport mode: you cannot set the powertrain and suspension independently, so you can't have a responsive powertrain and a supple suspension at the same time. Also, if you select sport mode then turn the ignition off, it reverts to 2WD mode, which you'll realize the first time you try to accelerate quickly on a wet or icy road and a front tire burns off some of its rubber. Because of EPA regulations they probably cannot have it remain in sport mode. But defaulting to 4WD mode would make much more sense. Or make this configurable. The 2007-2015 Mazda CX-9 was powered by a V6, but the new one drops two cylinders and adds a turbo. The 2.5 liter engine requires premium fuel to produce up to 250 horsepower. Otherwise, it peaks at 227 horsepower. I don't know which fuel the dealer had in the CX-9 I test drove, but its performance suggested regular unleaded. The engine felt fairly strong once moving in typical daily driving, but somewhat laggy when starting out from a dead stop and somewhat winded at highway speeds. Up to 60 mph the CX-9 seems nearly as quick as the Acadia. Above that mark, though, it probably cannot keep up. In the Mazda's favor, its transmission is much more responsive even in its regular mode. Sport mode makes it hold low gears too long for all but the most aggressive driving. 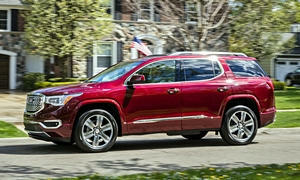 Owing to its size and weight, the first-generation GMC Acadia could go through some gas. EPA ratings are 15 mpg city, 22 mpg highway. The new Acadia achieves 21/26 with the four-cylinder engine and front-wheel-drive. This is better than the four-cylinder Highlander's 20/24. Step up to the V6 with the Acadia and there's a smaller but still meaningful improvement to 18/25. Among large V6 crossovers, the Honda Pilot does just a little better, with 19/26, partly thanks to a nine-speed automatic transmission. GM has started fitting its vehicles with nine-speed automatics. Once the Acadia gets this new transmission, its EPA ratings could match the Honda's. As is, it's near but not at the top of the V6 pack. Then there's the Mazda CX-9. Auto makers have been replacing V6s with turbo fours to boost fuel economy. While the actual benefits often fall short of those hoped for, the CX-9 does manage EPA ratings of 22/28 with front-wheel-drive and 20/26 with all-wheel-drive, the best of the bunch. In my suburban driving I observed trip computer averages as high as 27 mpg, but high teens and low 20s were typical. On a 70-mph highway the trip computer reported 27.3 in one direction and 22.3 in the other--it was a windy day. Average them and you get...the EPA highway rating. Though the Acadia and CX-9 are the same sort of vehicle, GMC wants its crossover to be perceived as a rugged truck while Mazda aimed to make its crossover as car-like as possible. This is evident in their styling, and in their driving positions. You sit high behind a deep instrument panel and a tall, brawny hood in the Acadia. The view forward from the CX-9's driver seat is much more like that in a car with a low, sporty instrument panel, just a little higher off the ground. The latter is more to my personal taste, but sales trends suggest that I'm in the minority. The Mazda's taller center console enhances perceived sportiness at the expense of perceived roominess. The two crossovers' front seats similarly differ. The Acadia's feel larger and cushier, but don't have much in the way of contour. I prefer the shape and lateral support provided by more form-fitting seats, like the Mazda's. The original GMC Acadia might have been the largest crossover you could buy, but it's second-row seating left much to be desired thanks to a flat, low-mounted cushion. Also, many smaller crossovers had more second-row legroom. Despite its more compact exterior, the new Acadia addresses both deficiencies with a more comfortable cushion mounted higher off the floor and more legroom when the seat is adjusted all the way rearward. The CX-9's second row seat cushion is even higher off the floor, so I found it even more comfortable. GM has managed to keep total legroom with an inch or so of the original Acadia despite the downsized exterior. So the third-row has adequate space for a couple of adults as long as neither they nor the people in the second row are tall. Typical of crossovers this size, sliding the second row all the way back (it can be adjusted fore-aft about five inches) nearly eliminates third-row knee room. The CX-9 has a little less total legroom despite being a few inches longer (thank its stylishly long hood). The Highlander's third-row seat is less suitable for adults, but it can fit three of them to the GMC's and Mazda's two. The Pilot's third row offers about as much legroom as the GMC's, but can hold three people like the Toyota's, so it wins this piece of the competition. Unlike that in the Mazda, it is possible to adjust the angle of the Acadia's third-row seat back. But this could be more trouble than it's worth. The seat defaults to its fully upright position, which is not comfortable. The amount of recline can only be adjusted using a strap dangling behind the seat that cannot be comfortable reached when in the seat. If you need more room, the 2018 Chevrolet Traverse will be even larger and roomier than the current Traverse and original Acadia. Compared to the new Acadia it will have about three inches more shoulder room and about two inches more total legroom, meaningful differences. Its third-row seat will have space for three passengers. Logic might tell you that if GM took seven inches out of the Acadia's length, but kept total legroom nearly the same, then there's not going to be as much space for cargo behind the third row. And there isn't. There are many difference ways to measure cargo volume, and the resulting figures can vary by 20 cubic feet (or more), so different specs can't reliability be compared even if they're from the same manufacturer. In response, I've started measuring the cargo areas of the vehicles I test. I don't have measurements for the old Acadia. But the 16 inches of floor behind the third row in the new Acadia compare to 19.5 in the pilot and roughly 21 in the CX-9 (it's rear door bows out more than most). This is at floor level. Measure at the top of the seat and both the GMC and the Mazda have less than a foot to work with. There's not nearly enough space behind the third row for a family's luggage in either. The Pilot's luggage area is a bit more viable, especially since its floor can be removed to open up a deep well. But if you really want to fill all three rows with people and still have space inside for their luggage, you want a minivan. These tend to have about 25 inches of floor behind their third rows. Or perhaps the 2018 Chevrolet Traverse. Compared to the new Acadia, it will have space for about twice as much cargo behind its third-row seat. GMC makes it especially easy to fold both rows. Releases for the second row are located just inside the tailgate. If a front seat is too far to the rear, though, it will block the seat behind it from folding. With both rows folded and the driver seat set for an adult of average size (me), the Acadia has about 80 inches of cargo floor, about the same as the CX-9 and about four inches less than in the Honda. As such it's competitive where the original Acadia was outstanding. With the redesign, the Acadia's maximum rated towing capacity has fallen from 5,200 to 4,000 pounds. The CX-9 is rated for even less, 3.500 pounds, but most large crossovers are rated for 5,000 pounds and the 2017 Nissan Pathfinder is rated for 6,000. GM seems to think that if you want to tow that much you should buy a larger vehicle. The new GMC Acadia and new Mazda CX-9 both rank at the top of their segment. I'd rather have either than a Honda Pilot or Toyota Highlander. Both ride and handle very well for the large three-row crossovers. Both have comfortable seating for five people plus adequate seating for two more. Typical of the class, neither the Acadia nor the CX-9 has much space for cargo behind its third row. Owners of the 2007-2016 Acadia might find the new one too small. That vehicle will remain in production for a little while as the Acadia Limited. Unless a similarly sized replacement for it is coming, though--and no one expects this--GM apparently expects current Acadia owners to switch to a Chevrolet or Buick. So which one to buy, the Acadia or the CX-9? It comes down to tastes and priorities. Do you want a smooth-riding truck that can skillfully handle a winding road when necessary, or an engaging compact hatchback that happens to have a luxurious interior (if one lacking some increasingly popular features) and seven seats? A question mark for both: how reliability will they be? Like any car in its first model year, either is at least a bit of a risk. The CX-9 carries the additional risk of a new turbocharged engine--turbocharged Mazdas have been troublesome in the past. We'll have reliability stats soon after enough owners have been participating in our quarterly car reliability survey. GMC provided an insured car with a tank of gas for five days. Diane Richmond helpfully provided a Mazda CX-9 for a comparison test drive. She can be reached at 248-741-7815. 2017 GMC Acadia pros and cons, according to Michael Karesh: the best reasons for buying (or not buying) the 2017 GMC Acadia. Join TrueDelta to post your own impressions. Concerning the CX-9: There's a limit to how far you can successfully stretch a platform and I think Mazda has done a laudable job growing the CX-5 to yield the CX-9 working with scant resources and physical production width limitations. Comparing the Acadia's 3.6l 6-cylinder with Mazda's 2.5l 4-cylinder seems pointless. Why not opt for the 4-cylinder engine in the Acadia for the purposes of this comparison? The Acadia's 2.5l 4-cylinder engine produces 193 hp @ 6300 and 188 lb-ft of torque @ 4400 rpm, versus Mazda's 227 hp @ 5,000 rpm and 310 lb-ft @ 2,000 rpm (on regular fuel). Using premium fuel on the CX-9 is optional and increases output to 250 hp @ 5,000 rpm, however the 310 lb-ft of torque remains unchanged whether you use regular or premium. At 4,305 lbs., the Acadia with 2.5l provides a power to weight ratio of 22.3 lb/hp, versus 19.0 lb/hp in the Mazda. The fact that the Mazda provides peak torque at a tick above idle should make the car significantly more tractable in normal driving although I'd expect it would run out of breath for high speed passing. As any diesel driver appreciates; torque rather than horsepower does the work. I think that Mazda learned its premium fuel lesson with the CX-7 where that model' fortunes were negatively impacted by the requirement for premium fuel to prevent detonation. Since the CX-9's horsepower increase with premium comes at the top of the RPM range, I doubt that many will be routinely twisting the engine in this SUV above 4,500 rpm so the horsepower increase with optional premium fuel becomes largely academic. Between these two models, it comes down to whether you'd rather be behind the wheel or sitting in a passenger seat and from that perspective the Mazda is the runaway winner. Having said that, if I were in the market for full-time 7-passenger utility; I'd have to agree with your preference for a Toyota Highlander. It looks like you hit the underline button at one point and never told the editor to stop underlining. The reason to compare the V6 is because the four clearly won't yield comparable acceleration. I don't know what you mean by my overall preference for the Highlander. I didn't recommend the Highlander here. If I did elsewhere it was for someone who places a high priority on reliability. Both the Acadia and CX-9 are new, so they have no track records and one or both could prove troublesome. I've tried editing four times now and even that I switch off the underline command after the word "requirement", it always defers to underlining all subsequent words in the comment. Malfunction with the editor function. Just tested underlining. Successfully replicated. Will look into it. I don't think this is our code, but there might be updated third-party code that will include a fix.